We help clients navigate the broad array of legal issues presented by transformative blockchain technology and the rise of digital currencies. BakerHostetler is a leader in advising clients who are deploying blockchain-enabled solutions or developing or using virtual currencies – whether they are integrating the technologies into established operations, re-engineering business practices, or creating new and disruptive applications. Our clients include businesses and not-for-profit organizations from startups to Fortune 100 companies in local, national and international arenas. Our attorneys collaborate across practice groups to provide practical advice on how to maximize the opportunities presented by the technologies while steering clear of pitfalls in a rapidly evolving legal landscape. We help clients understand how current laws and regulations apply to these technologies, plan or advocate for changes in the regulatory environment, and provide thoughtful insight to companies integrating these technologies into existing and prospective product and service offerings. Our team understands how and when a cryptocurrency may be a currency, a security, a network utility or a commodity, and the legal and regulatory implications of such designations. We help clients design smart contracts and work with them through the myriad legal issues that arise in initial coin offerings (ICOs) or token generating events (TGEs), including corporate and securities matters, tax issues, and other regulatory hurdles. We also advise clients on privacy and security issues specific to blockchain technologies and digital currencies, including cyber incident response, and represent industry clients in federal and state enforcement actions. 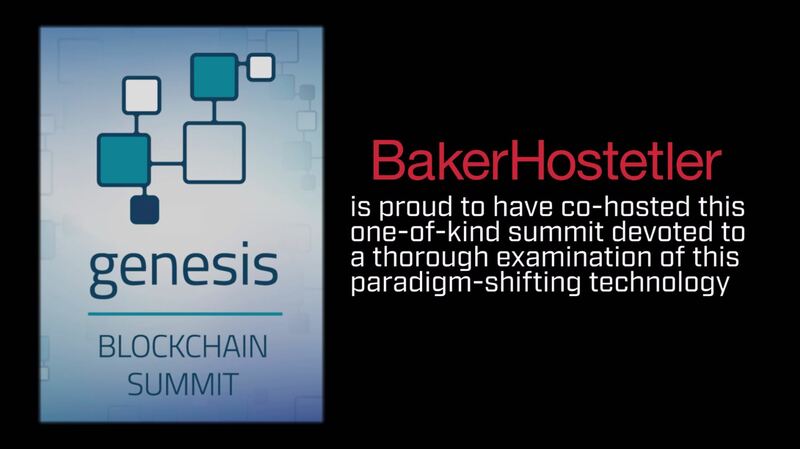 BakerHostetler is also a national leader in the drive to adopt blockchain technology and standardize its use in the legal industry and beyond. The firm is a founding steward of the Sovrin Network, the only global identity infrastructure that supports self-sovereign identity using a purpose-built distributed ledger at its core. We are also active members of the Enterprise Ethereum Alliance Legal Working Group and the Accord project, both of which exist to develop standards and protocols to facilitate the legally defensible adoption of blockchain related technologies such as smart (computational) contracts. We collaborate with clients to identify areas in which blockchain technologies will drive changes in existing laws and regulations to accommodate their use in corporate governance, privacy and digital identity, and regulatory oversight, as well as in execution of contractual agreements and maintenance of healthcare and employment records. Counseling multiple companies regarding the evolving regulatory landscape for token generating events such as ICOs. Advising multiple cryptocurrency industry clients on Gramm-Leach-Bliley Act; federal and state money services business registration; Bank Secrecy Act compliance; and consumer protection, privacy and cybersecurity matters. Serving as outside general counsel to a next-phase blockchain company, including advice on intellectual property, employment, corporate and other matters. Representing a blockchain startup in responding to an SEC subpoena related to a prior ICO. Representing a startup seeking to build a blockchain-based securities exchange regulated under Reg ATS. Provided government relations guidance to a prominent blockchain-enabled global payments company regarding federal and state legislative, regulatory and policy issues. Advising prominent blockchain digital identity companies on strategies for achieving compliance with the European Union’s General Data Protection Regulation (GDPR). Advised a digital currency industry client on response to cybertheft of data and attempted extortion. Providing patent prosecution and intellectual property advice to a distributed ledger platform client. Prepared and filed patent applications covering foundational blockchain technologies and application-level technologies layered on blockchain platforms. Collaborated with technologists to develop an intellectual property strategy to protect emerging blockchain-based technologies, including trademark, patent, copyright and trade secret strategies. Representing a major U.S. cryptocurrency exchange in a tax controversy matter. Fund formation and ongoing outside general counsel services for a global blockchain consulting firm. Advising a high net worth individual on cryptocurrency asset recovery and tax compliance. Engaged in discussions on blockchain solutions for the real estate industry with various stakeholders, including government entities, blockchain technology startups and industry representatives. Advised a major financial services company on developing and offering blockchain-enabled products and services, including intellectual property, technology transactions, cybersecurity and data protection issues. Counseling several advertising industry clients on the use of blockchain technology in adtech, including issues related to patents, incentive and reward programs, and use of cryptocurrencies. Participating in ongoing meetings hosted by a major global technology firm related to blockchain supply chain solutions and other enterprise use cases. Participated on a panel of academic, technology and privacy/cybersecurity leaders advising tech and government sectors on the use of blockchain technologies to secure and streamline elections. Oren Warshavsky Discusses "Digital Currencies and the Disruption of International Finance"
Five Things Blockchain Companies Need to Know About the GDPR.